Occasionally, a prospective customer will tell us how another mass notification provider has told them they can reach desk phones by placing a call through their telephone. While this may seem like a simple solution, the hidden complications can have severe consequences. Several factors will contribute to large numbers of simultaneous calls failing to get through; the most common being trunking capacity. This is the number of phone lines that are connected from a phone system to the outside world. Very few organizations (businesses, schools, hospitals, etc.) pay for an active outside phone line for every phone. The typical ratio is four phones for every outside line. That means, when a mass notification service provider tries to call all of an organization’s phones at once, 75 percent of these calls will be blocked due to lack of trunking capacity. If the mass notification system is smart enough, it will try repeatedly until it reaches every phone. However, a lot of time will have passed while those calls are being placed, which is far from ideal if there’s a real emergency unfolding. And if all of the trunking capacity is being used, no outbound phone calls can be made to 911 or anywhere else. Even if an organization had trunk capacity for 100 percent of its people, most phone systems would perceive hundreds or thousands of simultaneous phone calls as a denial of service attack. Their response would be to block many of these calls. InformaCast handles this very differently. 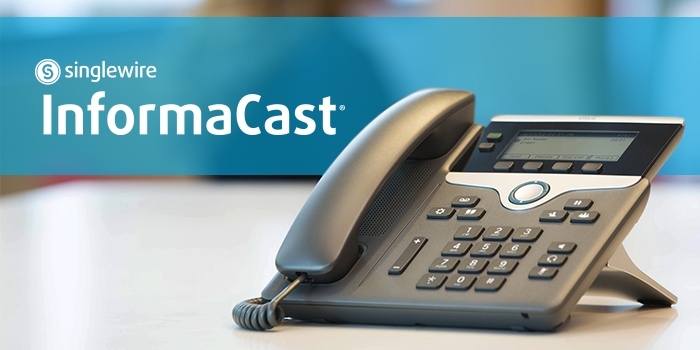 For Cisco phone systems, InformaCast sends a single multicast audio stream across the internal network and the phones play this audio stream via their speakers or the handset. This uses zero phone trunk capacity. There is no need for the end user to answer the phone because InformaCast automatically broadcasts the audio via the speakerphone. For those without Cisco phones, the InformaCast Desktop Notifier will pop up on the computer screen and automatically play the audio out the speakers of the Windows PC or Mac. That way, InformaCast can turn every phone and/or computer into an emergency notification speaker. For common areas like cafeterias, conference rooms and hallways, organizations may want to have InformaCast send the audio to an existing overhead paging system, or to InformaCast-compatible speakers. When an organization experiences an emergency, whether it be an active shooter, severe weather or some other crisis, they don’t have minutes to reach everyone. In that amount of time, the emergency may already be over before they’ve been able to reach everyone. An enterprise-class emergency notification system offers a clear advantage that reaches both mobile phones and on-premises devices like Cisco phones, computer desktops, overhead paging and digital signage, all with the press of a button, and without using any phone trunk capacity. Using InformaCast emergency notification software is a quick, easy solution to help keep people safe and informed.